Fresh seafood prepared by a passionate chef in Pacific Beach. 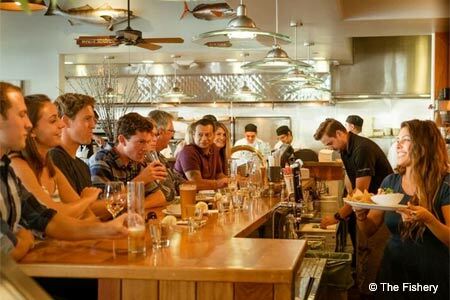 : Founded by Judd and Mary Anne Brown, this premium-seafood market and restaurant is a local’s favorite and worth the drive even if you don't live in Pacific Beach. The theme is freshly caught, sustainable seafood. Set in a restored vintage warehouse, The Fishery serves a variety of freshly prepared dishes using daily off-the-boat inventory. Chef Paul Arias changes the menu according to the season, as well as what has been caught, meaning only the best of what the earth’s oceans have to offer is available at any given time, paired with organic locally produced fruits and vegetables. Make the most of the quality ingredients by ordering ceviche, lightly seared ahi or oysters on the half shell. Cooked entrées that keep us coming back include the roasted wild salmon with miso-saké sauce, macadamia-crusted halibut with white corn purée, and blackened mahi mahi. Smart choices for lunch include littleneck clam chowder, a grilled swordfish sandwich with chipotle-lime marinade, and ceviche tostados. Look for chef Arias' weekly Tuesday Tasting Menu with optional wine pairings. Try the lemon meringue tart with fresh berries and raspberry coulis for dessert.